The Circus playset keeps the outdoor fun alive - all season long. Kids will not be able to pass up the trapeze bar with rings to show off their strength and flexibility to their friends. Next, kids will climb the rock wall and glance into the swiveling telescope to seek out their play area. The sweeping 9 ft. wave slide will provide the perfect method to access the next play activity down below. Children will then have the choice of swinging next to their friends or testing out their sense of adventure on the monkey bars. If your child loves to be creative, the included sandbox will let their creative minds wander too. Lastly, the large canopy provides plenty of shade, so children can cool off after many hours of continuous play - or create the perfect fort. While inside the play deck, many tic-tac-toe battles will commence as well. With all of these imaginative and electrifying features, your children will be entertained all season long. Play deck height: 4'8" | Play deck dimensions: 3.5' x 4.5' - 15 sq. ft.
Recessed bolts and hardware - All bolt connections are recessed, ensuring no cuts, scrapes or torn clothes. Rounded corners and edges - virtually splinter-free. Plastisol coated belt swing chains - no more finger pinching. 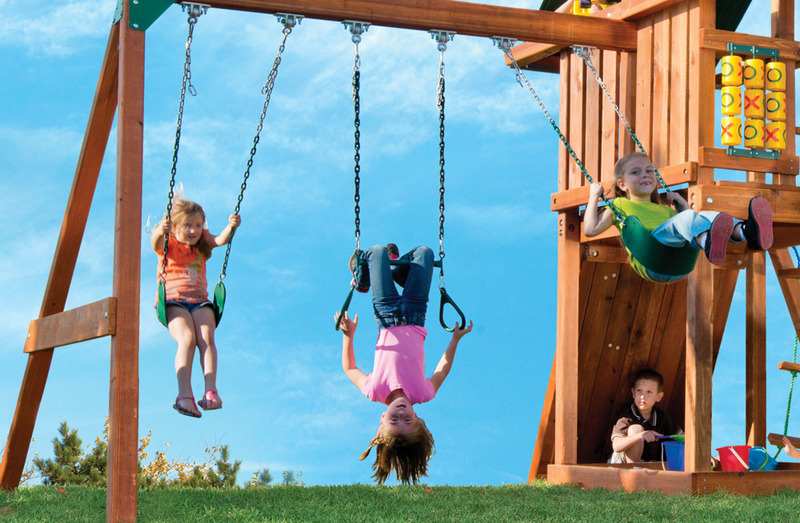 While our redwood playsets are hand-crafted to eliminate unnecessary cuts and scrapes, we suggest adding a fall surface under your play structure to add another layer of protection for your children – just in case they lose their balance and fall. We recommend to add rubber mats, rubber mulch, wood chips sand or pea gravel under your playset. To see a pros and cons list of the best materials for under a playset, check out the resources tab on this page. For a detailed guide on playset fall surfaces,be sure to check out our resources tab on this page. This playsetset is intended for residential use and is not warrantied for public or commercial use. This playset has been designed for use by a maximum of eight children at one time, having a combined weight of 1,200 pounds. 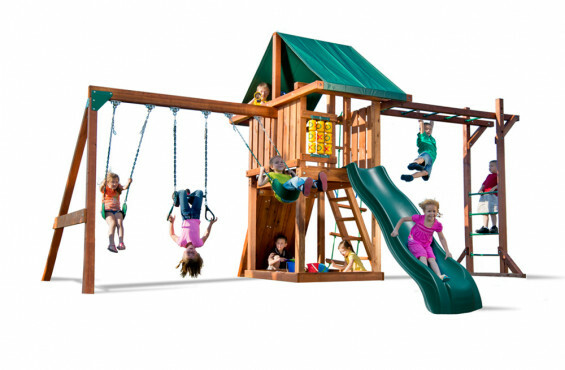 This outdoor playset is recommended for children 3 years through 11 years of age. 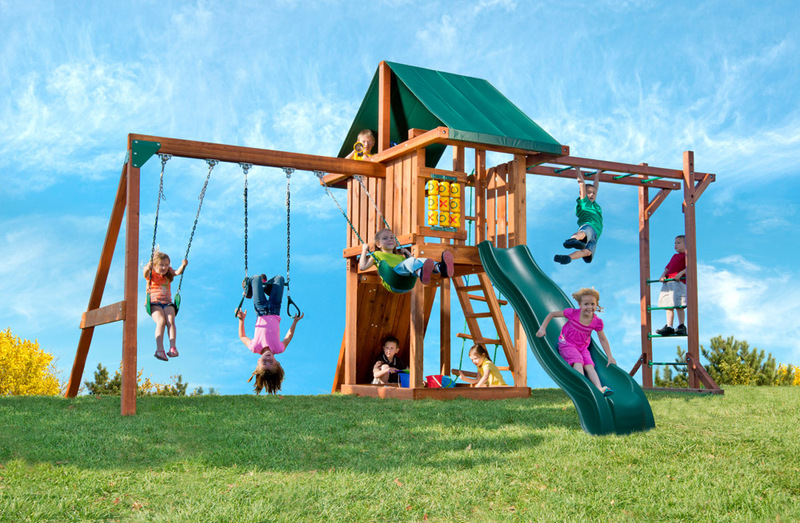 We welcome anyone to build our playsets, even those with little do-it-yourself experience. Each outdoor playset kit is pre-cut, ready for assembly and can be built with basic tools, so you don’t have to be Bob Vila to install our playsets. Actually, parents often comment on how much pride they have building their playset on their own. Don’t worry, if you have questions during assembly, our dedicated customer service team can answer your questions via phone or online chat. We also offer professional installation on our Signaure Redwood Series of playsets for as little as $249. 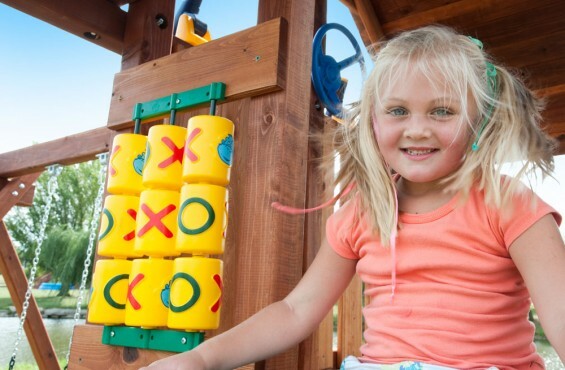 Checking, splitting and surfacing cracking are characteristics of all wooden playsets. This is caused by varying seasonal outdoor temperatures and moisture conditions. 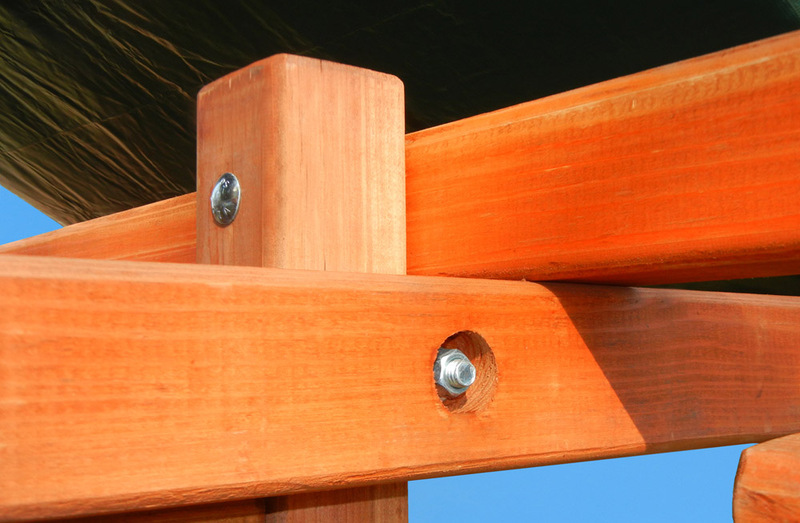 To minimize this checking and/or cracking, you may coat your play set with a water repellent. The Circus playset is factory stained to provide a beautiful finish and long lasting protection. 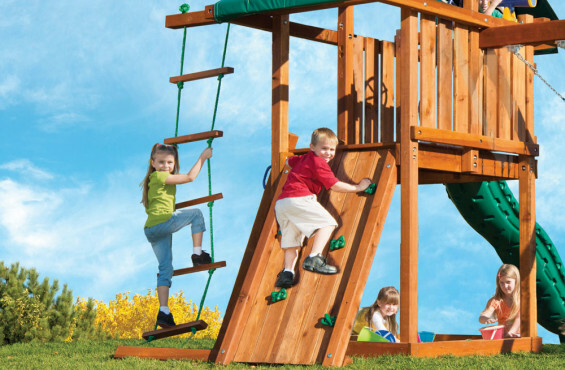 We recommend staining wooden playsets once a year to maintain its rich color and naturally resilient qualities. Prior to staining, clean all wooden components. Use a high quality water based stain or sealant such as Thompson’s Water Seal® . After staining or sealing, please allow 24 hours to dry before allowing children to start their adventure. Kids Creations came highly recommended from a friend, and are also very pleased! Pros: Very high quality, wide variety of activities for the kids (8 and 4). Very strong structurally - neighbors have Gorilla sets, which are significantly less structurally sound. Not even in the same league as this set. Cons: My set was missing some hardware for the rock wall, which fortunately I was able to locate and purchase at Home Depot. 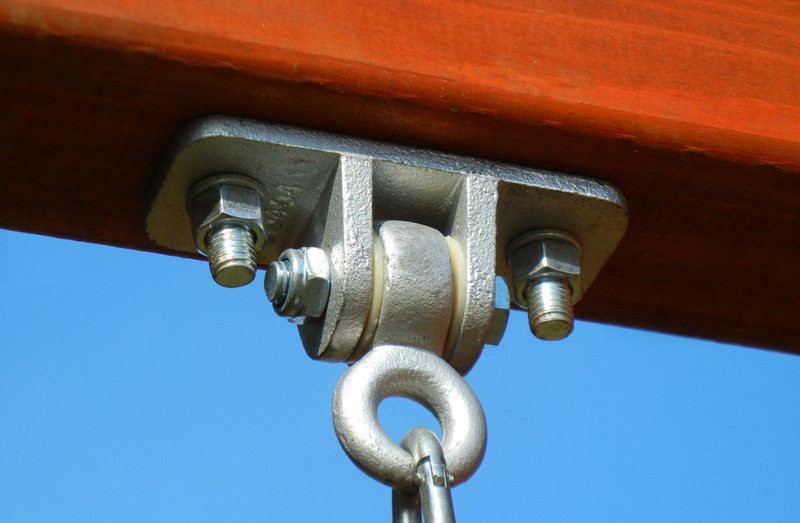 Squaring the tower is not an easy task, but is critical for the success of the installation. Cedar splits easy! Pre-drill every hole. Every hole (including the roof with over 100 screws). Some of my boards had some natural cracks & splitting, which I felt for the price, should have been QA'ed a bit more rigorously by the manufacturer. Installation time: 2 full weekend days, and 2 hours each night after work for 4 more days for 2 adults. Take the time to pull out all the pieces and hardware and label. It makes installation go much faster. Kids are still enjoying this and no issues so far. We are so grateful for all of the extra effort that you put into Joanna's Swing Set. In her case, it was installed with extra elements such as the sand table, walking beam and the rock wall with two more slides. Your addition of the extra steps and platform also will make this much more user friendly for her. She will truly grow into to her playground. Her therapist has seen everything and was quite pleased...her walker...serves (as) a reminder that she wasn't really expected to walk...We thank you so much and will recommend you to others who would benefit from your services. We have an issue with our Circus Deluxe Redwood playset first installed in April 2013. The heavy redwood crossbeam has an infestation from a wood-boring insect, likely Japanese beetle. We didn't detect it until we saw the superficial part of the damage on the south side of the playset, which faces away from the back, also south facing side of our house. The bugs need the sun, I suppose, so they were eating away at the far side of the playset, unseen from the home or swing users. This could quickly become a structural problem, and needs replacing. There is one cross beam on the clubhouse also affected with minimal damage at present. I had thought that Redwood was insect resistant. Please let me know when you could replace the 7" swingset beam beam, and also recommend a chemical application to limit the damage to the clubhouse crossbeam as well. 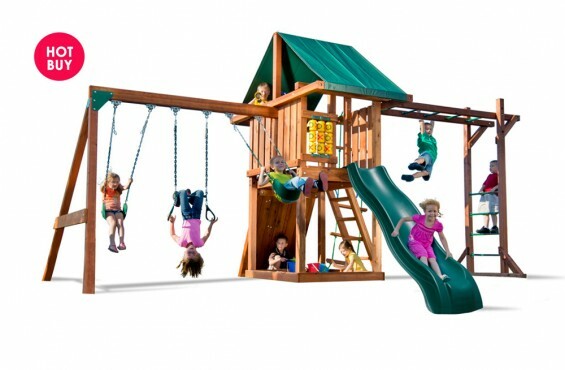 Great playset, high quality, durable. Good customer service, too. Just a few minor hiccups during installation -- it was clear a few of the pre-drilled holes on the monkey bar structure were incorrectly positioned and we had to 'make our own'. Overall a great value, would definitely purchase again. We liked our first so much we bought a second...but probably not again. We bought the Circus and LOVED the quality of the wood and the sturdiness of it. When we moved we had to leave it with the house but we didn't even bother looking at new playsets for our new house we went right to Kid's Creations. This time we got the Circus w/ monkey bars. We built both sets ourselves and noticed a significant difference in the directions the second time around....they were no where as clear as the previous ones (why would you mess with a good thing??!!). Also, the wood on the second set has splintered significantly more than the previous set (we had the previous set for 2.5 years and have had the second one for one year). I'm not sure we would go this way a third time....there seems to be a decline in quality which is a shame because the first time around we were beyond impressed.